Phenology is the study of the timing of seasonal life cycle events (e.g., the appearance of breaking buds, flowers, ripe fruits, seed dispersal, egg-hatching, fledging) in plants and animals. The California Phenology Project (CPP) was launched in 2010 with funding from the National Park Service Climate Change Response Program to design and to implement long-term phenological monitoring and public education in California. 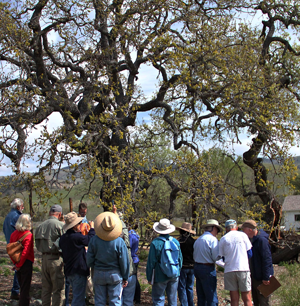 Our primary focus has been to recruit, train, and encourage California residents and visitors to record and to interpret the phenological status of wild plants. After more than seven years of phenological monitoring, and thanks to the enthusiasm, dedication, and daily trail-walking among our volunteers, the CPP is still going strong. Participants have recorded -- and uploaded into the USA National Phenology Network's user-friendly interface, Nature's Notebook -- more than 1,500,000 observations of the phenological status of wild plant species in California. Scientists are now using CPP data to measure and to predict the effects of climatic variation and climate change on the seasonal cycles of ecologically important and iconic California species. The CPP initially focused on monitoring woody plant species in seven pilot parks, encompassing desert, coastal and mountain biomes, and building upon existing monitoring protocols and programs of project collaborators. With the help of many partners, volunteers, and docents who attended CPP-led training workshops, phenological monitoring is now being conducted in California in over a dozen regional and state parks, botanical gardens, private reserves, and University of California Natural Reserves, where ~30 native plant species are now being monitored. Please explore our website to learn more about phenology, the origin and current activities of the CPP, where the CPP is currently monitoring plant phenology, and how to become involved. Also visit the news tab for recent updates and upcoming events. Project collaborators include the National Park Service (NPS), the University of California, Santa Barbara (UCSB), and the National Coordinating Office of the USA National Phenology Network (USA-NPN). Visit our cooperators and points of contact page to contact us directly or to learn more about the project partners who are currently spearheading this effort. 1) Contact the naturalists or volunteer coordinator(s) at the CPP partner site that’s closest to where you live. If you can join them on some of their phenological monitoring outings, that would be a perfect way to see monitoring in action and to begin to do it yourself at your own preserve. Inspect the reserves and state parks where monitoring is currently occuring. Are any of these reserves near to you? If so, click on the appropriate location to reach their contact information and to see the list of species being monitored there. If one of these species is of interest to you, click on the species' name and download the datasheets and species profile (using paper data sheets is unnecessary if you have downloaded the Nature's Notebook mobile application, available for free from the Google Play or Apple iTunes store). You can see the complete list of species being monitored as part of the CPP. 2) Read (and follow!) some of the instructions for phenological monitoring and for contributing your data to the USA-National Phenology database, available on the USA-NPN website (usannpn.org). If any of your targeted species are the ones we’ve been monitoring as part of the CPP, you can download the data sheets and species profiles from the CPP website. 4) Download the Nature’s Notebook mobile application from the Google Play or Apple iTunes Store. This will allow you to upload your field observations without using the paper datasheets mentioned above. You’ll need to create an account on-line to use Nature’s Notebook. Then, take a look at the “Nature’s Notebook Obervation Deck Refresher Course” YouTube video. There are other Webinar Videos available on the USA-NPN Channel as well. 5) Explore the USA-NPN educational materials for other activities to run at your nature preserve. You won’t run out of ideas for infusing all of your field classes with phenological concepts and observations!